Can I make changes to my smart waiver after it is created? Yes. 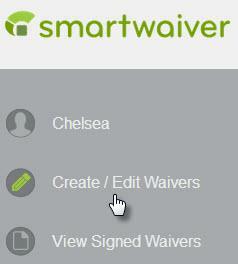 You can make whatever changes you'd like to your smart waiver at any time using the Smartwaiver Waiver Editor. and then click on the Edit button next to the waiver. From here you can update the text in the Body of your waiver, alter your logo, change the colors, add or change custom questions on the waiver as often as you like. Can Smartwaiver convert my waiver into a digital waiver for me?